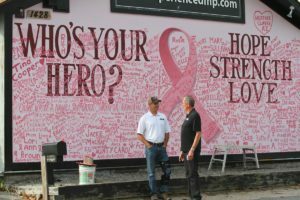 The most common cause of cancer in the U.S., according to National Cancer Institute, is Breast Cancer. Whether you, or someone you know, has been affected by this disease, it’s a tough one to bear alone. 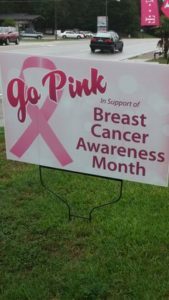 What better way to show your support than to display the iconic pink ribbon. 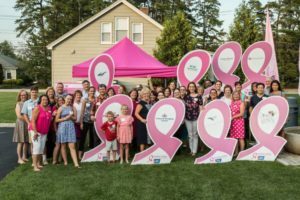 If you are hosting an event, or proudly displaying pink in your lawn, here are some ways to show your support for those fighting a tough battle and show them they’re not alone. 1. 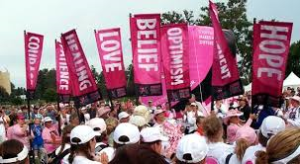 Banners: Get creative and chose empowering words to motivate people and remind them of why it is important to come together for a good cause. 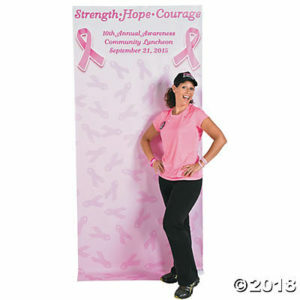 Having unique banners can also be a good place for people to locate each other in a crowd. 2. Lawn Signs: Show support from the comfort of your own home. Let people in your neighborhood see the sign and get inspired. It will be a sign of comfort to those who may need it. This may even cause a chain reaction and have them knocking on your door asking where they can get their own. 3. Cut Outs: Ranging in shape and size, cuts outs can be the perfect posing partner for individuals to use. They are a great way to showcase your support. Keep them in good condition and you can recycle them for the next event too come. 4. Wall Mural: Wall murals are a great way to cover up a boring building and add some illustration to it. They bring art into the public sphere. Not only are they easy to install, but they can last the duration of a campaign, or in this case, the month with little to no signs of wear. Some can even be interactive and allow people to add their own personal touch. Just don’t forget to supply the pink ink! 5. Back Drop: Everyone loves a good background to make a picture really stand out. Using backdrops can be a good way to hide unwanted sights. Another good use for them is a place to advertise. Allowing a company to partner with the event can help drive awareness and traffic for both parties involved in the picture. If you want your picture to gain some relevance, remember to use #hashtags.